Ubisoft shifts its focus from assassination to diplomacy in a strategic board game for Apple's tablet. If you, like many other aspiring Assassins, have been hunting for the Apple of Eden, your best tool might be another Apple. 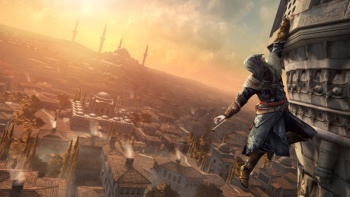 Not content with releasing Assassin's Creed: Revelations this holiday season, Ubisoft has announced a companion game for the iPad. Assassin's Creed: Recollection departs from the tried-and-true parkour/combat formula of the previous games and opts instead for a diplomatic board game. Recollections seems like it delivers the fun kind of diplomacy: the kind that involves armed guards, scheming Templars, and more Roman landmarks than you can shake a hidden blade at. The game will challenge players to think tactically while recruiting a diverse army of characters, assets, and locations to change the political landscape of Renaissance Europe. Gameplay details are pretty sparse at this point, but Ubisoft has promised an 8-10 hour campaign, replete with "tactical political battles," and a focus on collecting people, places, and matÃ©riel. A screenshot from the game suggests that these resources will take the form of trading cards, complete with a system of ratings, abilities, and varying skills. Furthermore, players will be able to face off against each other using their own meticulously-constructed decks. As an added incentive, the game will come with a free copy of Assassin's Creed: Embers, an upcoming animated short about Ezio Auditore as an old man. Recollection is the first portable Assassin's Creed title to take a radically different approach to the series's gameplay. Given the relative weakness of previous handheld outings, this is not necessarily a bad thing. The Assassin's Creed series has always been as much about setting as it has about its story and characters, so providing background information about the trials and tribulations of Europe's political leaders should only help to strengthen the central narrative. Currently, there's no specific date for the title beyond "Holiday season 2011," nor is there any word of an iPhone or Android port.